I have been thinking about this post for awhile. Really since I wrote the post on the best 3 reasons to read Fifty Shades of Grey. From all the buzz around Hollywood, there are a lot of people who have a big interest in playing this character. I know that Universal Pictures and Focus Features were the successful studios that secured the rights to the film version of the book. Universal Pictures and Focus Features now have one of the most difficult jobs to be performed – casting Christian Grey and Anastasia Steele. I am sure this is kind of like how it was to find Bella and Edward from Twilight. I do not envy the job of the casting agents – that will be hell and they are probably going to get some form of negative press for whoever they pick (because we all know you can’t please everyone). However, I did want to add my own opinion as to who should be on that list (and I really want to hear from others also!!!). Since I am going to be one of those people that will definitely be checking out the movie, I thought that it would be appropriate. I have to say that I thought long and hard about this (because this casting will determine whether I actually go and see the movie) and Alex Pettyfer is at the top of my list. Not only is he the one that I can picture immediately as Christian Grey, the others are far behind him. He is younger than Christian Grey but there is something about him that exudes the characteristics of Grey and all that he is. Plus he has the looks down and I can definitely picture him with no shirt on…so I am Team Alex! I know that he doesn’t have the best reputation but with landing a role like this hopefully he would understand how lucky he is and all the doors that this role will open! My second choice is someone that is a little older (because he is in his 30s) but Alexander Skarsgard still has the looks and the talent to pull off the character. He also has a way of really getting into character and making you believe in who he is portraying. Plus, Alexander looks amazing without a shirt and without anything on – plus he is the one actor who has shown a lot of skin (on True Blood) and doesn’t seem to shy away from it if that is what the role calls for. My last choice was even a surprise to me but the more I thought about it, the more I could picture Henry Cavill as Christian Grey. Plus after the Immortals, I know that he looks great without a shirt on and those eyes just draw you in. There would have to be a change in the hair color but with Hollywood movie magic that shouldn’t be a problem. Who do you think should be cast as Christian Grey? I really want to know what others are thinking out there – so leave comments! I haven’t talked a lot about this show in my other posts but it is one of those crazy and amazing shows that I love to tune in to. As an avid book lover, I have read all The Southern Vampire Mysteries series by Charlaine Harris – which as many people know provide the basis and characters for True Blood. From the very first book I read, I was hooked. I loved the storyline and the characters. I especially liked how the books progressed with certain characters. I will not say anymore about that because I don’t want to spoil the books for people – they should be read. When True Blood first came out, it was my awesome big sister that told me about it…the two of us have a habit of sharing all the shows that we think the other would like…she told me about Legend of the Seeker (which I absolutely love now – many people might not be familiar with it – another show based on a book series by Terry Goodkind – which unfortunately only had two seasons but epic characters – Richard and Kahlan!!!). I, on the other hand, introduced my sister to Sons of Anarchy – which she now watched and loves. So, I took my big sister’s advice and watched True Blood.Well, I was hooked. Although not totally like the books (which was to be expected) – the writers have done a good show of integrated some of the core aspects in. Some storylines I could do without but understand why they need to be in there. From all the seasons, season 4 was the best for me (you will understand why by the best 3 provided) but I am excited for Season 5 and that is why I wanted to dedicate a post to True Blood. Ok. I am going to say it…I am Team Eric. 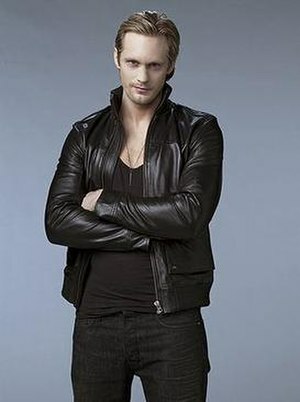 I have been from the very start and let me say, Alexander Skarsgard plays Eric Northman perfectly. I can’t picture any one else in the role. He is just great. He is one of the main reasons I continue to watch True Blood, plus I love his character. Since I don’t want to spoil anything for other people who may not have watched the show…let’s just say, Eric and Sookie are just meant to be…Again, I want to say it…I am Team Eric. I am just so excited to see how Season 5 will progress for Eric and Sookie…there are feelings there that cannot be denied…and I think are a lot stronger than with the other guy (Bill). If you have not seen the trailers for Season 5, I have added it. Russell Edgington is back…and I don’t think he is happy – so that will definitely make for an interesting season. Sookie’s love life is my last best 3 pick because as you can tell from my first pick, I want her with Eric and I would like to see more scenes of them together. They have chemistry and she is able to love both the good and bad of Eric. Something needs to be done this season where Sookie’s love life either gets better (with Eric) or with no one at all. For this post, I’ve decided to take a different turn and focus on something that seems to dominate my life lately. Yes, that is television. I can’t say why, maybe because it is a nice change from the real world or maybe because it has the ability to make me forget all the things going on in mine…I don’t know why, I just know (lately) I am obsessed and fixated. Let’s be honest, there are a great deal of “crappy” shows that dominate tv right now and usually they focus on doctors, lawyers and cops. To me, its really been hard to find characters that I like and respond too. There have been a few over the last few years, and that is why this post is going to focus on the best 3…tv couples. To me, these couples are just perfect. They make me want to stay tuned for more and more and more. I love watching them together! and I love the chemistry that the actors are able to provide to make the characters/couple more realistic and likeable. There will probably be a lot of people that would not agree with my best 3 but that is ok because this is my own opinion and for those that don’t agree or have others, please post your comments – I would like to see what other couples you might like. My first best pick should be obvious, as I’ve listed the Sons of Anarchy in this blog before (Best 3…TV Shows (on tv right now) and one of the reasons that makes the show great is the couple of Jax and Tara. They were high school sweethearts, she leaves and then comes back and they can’t deny their attraction to one another and they fall in love all over again. Trust me, if you have not seen the show or them, please do. There romance is far from perfect…but somehow they just work and that is what makes them the best. My second best 3 pick gave me some of my most favorite tv moments ever. Putting these two together was pure genius. Yes, I am team Eric. Sookie and Eric together is this last season of True Blood was simply great (and the best season in my mind). Their chemistry was amazing. It pains me to think that they may not be together in the upcoming season. There is just something about them that just makes their time together perfect. All I can say is that if you were not fortunate to catch some of their scenes together, I encourage you to tune in…not only are they on a great show but together they fired up the season! The last couple is from a show that many people might not be familiar with. Like Sons of Anarchy, I have mentioned this show before (Best 3…odd bu excellent British tv shows) and it has been only recently (thanks to my awesome sister) that I have discovered the show and my last best 3 pick. That honor goes to Simon and Alisha. They were a couple that you would never imagine together especially after the first season but through great writing they come together. I won’t go into a lot of details but they have a great story that will go on and on. Thanks to all the people that posted these awesome videos!